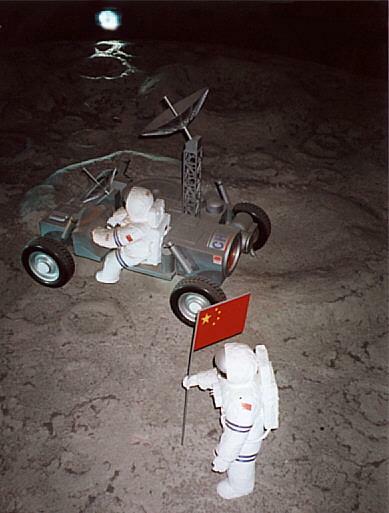 Chinese astronauts with lunar rover plant the flag of the People's Republic of China's flag on the lunar surface - model at the Chinese Pavilion, Hannover Expo 2000. Chinese manned lunar base. Study 2025. 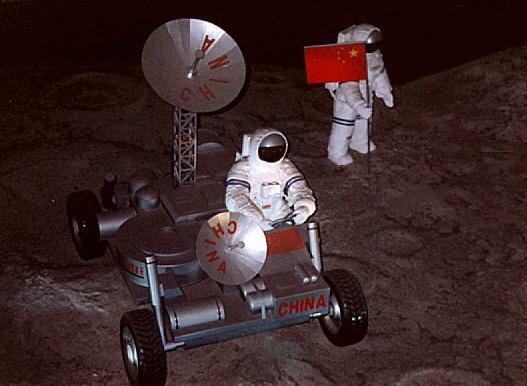 Beginning in 2000, Chinese scientists began discussing preliminary work on a Chinese manned lunar base. Status: Study 2025. Gross mass: 40,000 kg (88,000 lb). Although not funded, it remains a long-term objective of the Chinese space program for the second quarter of the 21st Century. 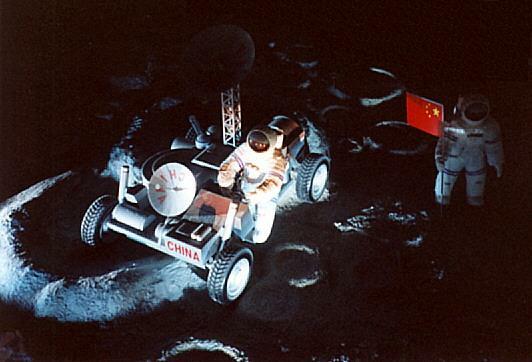 Chinese astronauts would begin landings on the moon in 2005. An initial lunar station would be built up with pressurized modules, electrical generators, and roving vehicles. The station would be completed by 2010, allowing stays of several weeks for extended science experiments. Beginning in 2015, construction of a small permanent Moon base would begin. The objective would be for a self-sufficient lunar base to be in operation by 2020. This would be a bridgehead for construction of a network of solar power generating plants. The power would be transmitted back to Earth via microwave to meet Chinese power needs without adding to earth greenhouse gases. The base would also process the lunar regolith for metals and gases needed to support the base. The natural high vacuum would be used for research and production of new materials for export to Earth. Phase 2, by 2010: unmanned soft-landing missions. Phase 3, by 2020: Robotic exploration using surface rovers. Phase 4, by 2030: Lunar sample return missions. Only after 2030 would manned flights and construction of a lunar base begin. The Shenzhou manned spacecraft provided the Chinese with the required hardware to pursue a lunar program whenever they make the decision to go. The configuration of the re-entry capsule of the Shenzhou was the same as that of the Russian Soyuz. This was designed and flight qualified in the 1960's specifically for return to the earth from the moon. Using proven Chinese Lox/LH2 technology, a lunar-lander using the Shenzhou spacecraft could have a mass of under 40 metric tons. A Lox/LH2 stage of the about the same size would be required to propel it toward the moon. Launch of such payloads into low earth orbit would be within the capability of an upgraded version of the CZ-5-5.0 booster using 8 x 3.35 m diameter strap-ons. This could be available as early as 2010. Two such launches of a CZ-5-5.0 - one of the lunar injection stage, and one of a Shenzhou-derived lunar lander - could place the necessary payload into earth orbit. 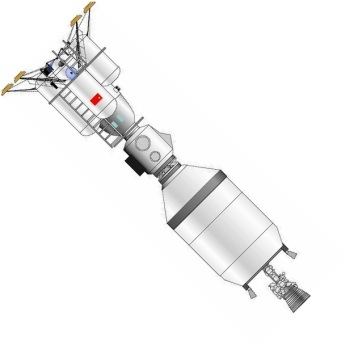 After docking with the booster stage, the Shenzhou would be boosted to a direct landing on the moon. The direct landing approach was shown in Russian studies of the 1970's to be the most practical method for emplacement and support of a lunar base (since lunar orbit rendezvous methods restrict possible base locations to a narrow band around the lunar equator). Trans-lunar injection stage: This would have a gross mass of 39 metric tons at ignition, an empty mass of 4 metric tons, and a specific impulse of 460 seconds. It would place the Shenzhou lander into a highly elliptical orbit around the earth. It would use the 40 metric ton thrust engine planned for the CZ-5 family. Lunar landing stage, 28 metric tons gross / 4.5 metric tons empty (including landing gear). This would land the spacecraft on the lunar surface and form the launching platform for the return spacecraft. Shenzhou-derived return spacecraft / ascent stage, 11 metric tons gross / 5.5 metric tons empty. This would consist of a 1 metric ton orbital module (adopted for use as a cockpit for the crew during the landing maneuver), the 3 metric ton Shenzhou re-entry module (for 2 to 3 crew) and a modified service module (7 metric tons including 5.5 metric tons of propellants). This would be a marginal design - a more robust concept using two 39 metric ton boost stages and a 39 metric ton lander could deliver a 16 metric ton payload to the surface or use the existing storable propellant engines in the Shenzhou return stage. Family: Chinese Manned Spacecraft, Lunar Bases, Moon. Country: China. Bibliography: 424, 434, 460. 1998 March 21 - . China to Launch Lunar and Mars Probes - . Nation: China. Spacecraft: Chinese Lunar Base. "China will actively participate in deep space exploration during the 21st century," said Mr Yuan Jiajun, vice-president of the Chinese Academy of Space Technology. China also planned to launch two astrophysical satellites into low earth orbit, one in equatorial orbit and another in polar orbit. 1999 October 22 - . 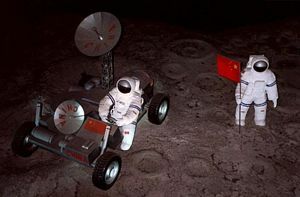 China Plans Exploration of Moon and Mars in 21st Century - . Nation: China. Spacecraft: Chinese Lunar Base. A national conference of space scientists held in southern Beihai, Guangxi, said that the Moon and Mars were the 'two big targets' for the country's space programme in the 21st century. Ye Zili, the China Space Science Association's General Secretary, said that dozens of plans and proposals for the two projects had been put forward. However no substantial government funding for such projects was to be available in the immediate future. 2000 October 19 - . No immediate Chinese lunar landing plans - . Nation: China. Spacecraft: Chinese Lunar Base. 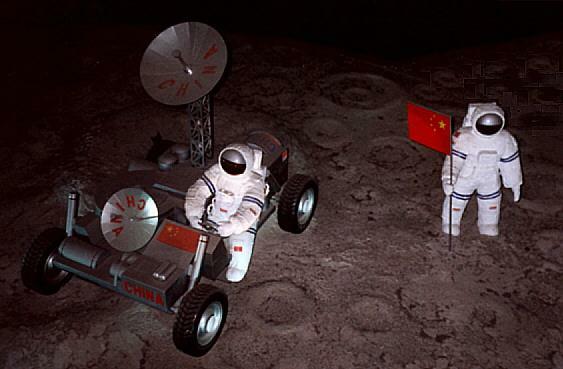 Chinese scientists clarifed that their space robotics research was purely academic and that there was no officially authorised Chinese lunar landing program..
Chinese Lunar Exploration Plan - . Nation: China. Spacecraft: Chinese Lunar Base. A Chinese aerospace magazine indicated that Chinese scientists had drafted a four-phase long term plan.